Two married or common-law adults aged 65 years or older. If you register online, you will need to send payment via Interac e-Transfer for the total amount owing to complete the registration process. If you would prefer to pay by cash or cheque, please register at the Club. I am aware that participating in the activities, without limitation, offered by or associated with, the Welland Tennis Club, exposes me to inherent risks, dangers and hazards. By engaging in any activities offered by or associated with the Welland Tennis Club, I freely accept and fully assume all inherent risks, dangers and hazards and the possibility of personal injury, death, property damage or loss resulting there from. 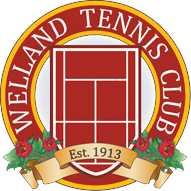 In consideration of permitting me to participate in its activities, permitting me to the use of its equipment, and its facilities, I hereby agree to waive any and all claims that I have or may in the future have against the Welland Tennis Club, its directors, officers, employees, agents, representatives, assigns and successors. I also acknowledge that due to the nature of media coverage, my likeness may appear in print or online.